Randyn Fullard as Byrd. Photography by Renee Rosensteel for the New Hazlett Theater. As part of The Glassblock’s sponsored partnership with the New Hazlett Theater, we are presenting a series of editorially-independent previews and reviews of the 2016-2017 Community Supported Art (CSA) Performance Series. Below is our review of Kalopsia by Monteze Freeland, a collaborative response from editor Adam Shuck, arts and culture editor David Bernabo, and guest panelists Julius Boatwright and Adil Mansoor. Read their bios below. And read our preview of the performance here. Julius Boatwright, MSW, LSW, is the founder and CEO of Steel Smiling. He also serves as executive director of the Will Allen Foundation. Boatwright is a licensed social worker and holds certification in mental health first aid. Boatwright recently shared a talk at TEDxPittsburgh and was recognized by The Incline as a community leader. Above all, he wants you to know that you’re loved, valued, and appreciated. 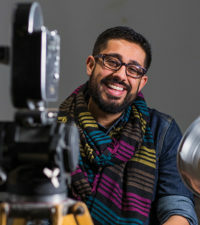 Adil Mansoor is a Pittsburgh-based theatre director. He is a founding member of Hatch Arts Collective, a group committed to creating socially engaged performance. He has directed numerous Hatch productions, including Driftless by Paul Kruse and ensemble-created Reasonable Assurance. In 2015, he was a Gerri Kay New Voices Fellow at Quantum Theatre and directed Hatch’s Chickens in the Yard by Paul Kruse. In 2016 he directed Quantum’s production of The River by Jez Butterworth. He has also directed with Bricolage, Pittsburgh Playwrights, Prologue Theatre, Gorilla Tango, and others. Mansoor has worked as an artist educator for the last ten years with organizations including The Andy Warhol Museum and Middlebury College. He also directed programs at Dreams of Hope, an LGBTQA+ youth arts organization. In the fall of 2017, Mansoor will begin an MFA program in directing at Carnegie Mellon as a John Wells Fellow. The Blu Byrds join Byrd in his reverie. 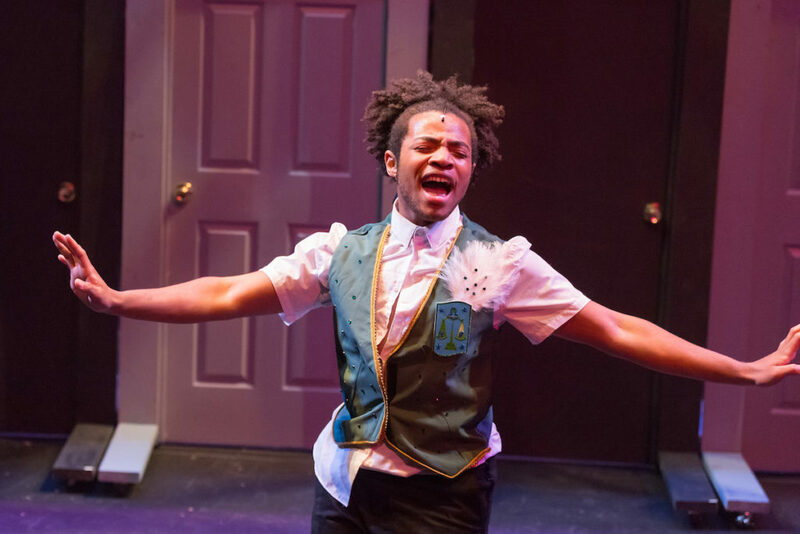 In our pre-performance conversation with Monteze Freeland, the playwright and director of Kalopsia, which was staged at the New Hazlett on June 1 and 2, 2017, he explained the meaning behind the word made from a mash-up of two ancient Greek roots. Described as the delusion of seeing things as more beautiful than they are, the concept of kalopsia encapsulates a bittersweet duality: finding yourself enthralled but, ultimately, lost within what’s really an illusion. 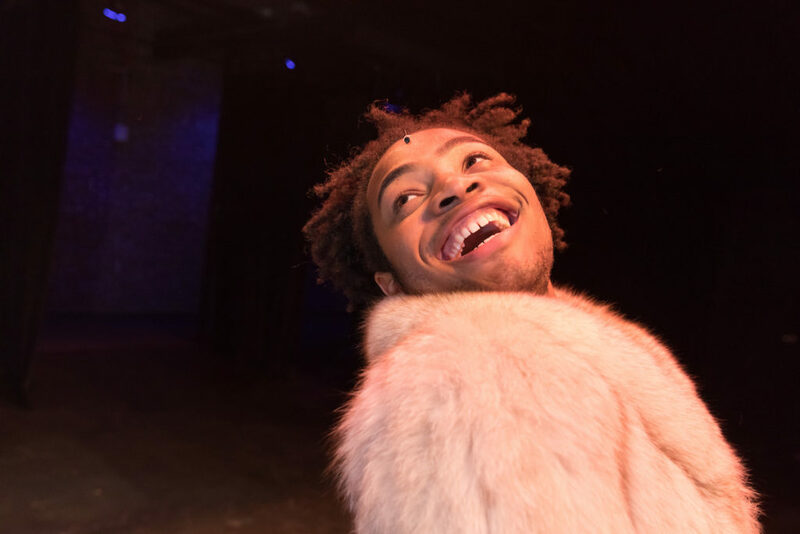 Byrd, the protagonist of Kalopsia portrayed by Randyn Fullard, is a young, vivacious character. As the play opens, he and a coterie of singers welcome the audience with a funky musical number. “Byrd’s the boss,” they intone, and with a limber choreography and flashy costuming, Byrd asserts himself confidently. But, really, Byrd isn’t the boss. At the close of the opening musical number, we learn he’s an employee of a Pittsburgh hotel, and his boss, Mr. Whitman, played with boorish gusto by Victor Aponte, shows his disrespect for Byrd, stopping off at a urinal and then, to groans of disgust from the audience, wiping his hands on his employee. Larry, Byrd’s co-worker and friend portrayed by Sam Lothard, looks out for Byrd. Byrd is hoping for a promotion, and he therefore has to suffer Mr. Whitman’s abuse. “Let me see you walk like a boss,” Larry coaches Byrd, urging him to take on a more masculine gait—which is played for laughs—speaking to something deeper, a layer of difficulty that Byrd has with fitting into the world around him. Responding to a hotel guest’s call, Byrd finds a luxurious, cream-colored fur coat in an occupied room. 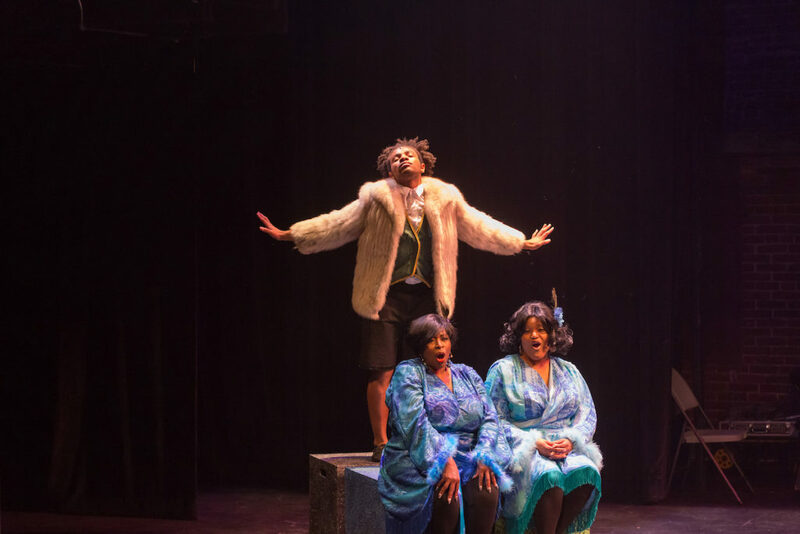 He is enraptured by it, flush with memories of his elegant grandmother, and his imaginary singing duo, the Blu Byrds (Dominique Briggs and Cheryl El-Walker), appear to amplify and enable Byrd’s reverie. And he does. Byrd soon finds himself, albeit hidden by sunglasses and after some hesitation in the corridor outside the office, on the couch of a puckish, cheeky psychotherapist, a woman named Hattie Lincoln Scott (Hope Anthony), played by Hope Anthony. In a battle between Byrd’s imaginary Blu Byrds and Hattie, the therapist wins out, and the Blu Byrds disappear. 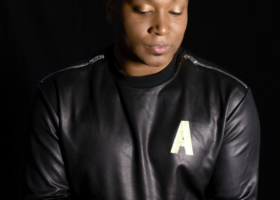 Despite his early frostiness, Byrd leaves feeling energized by the conversation, which focused on an early childhood memory and his relationship with his mother. Ultimately, Byrd is well on his way to getting “his mind right,” as Hattie promises. In a therapy session, Byrd’s imaginary Blu Byrds duo do battle with Hattie. But back at home, Zach discovers that Byrd has gone on a wild shopping spree, spending an exorbitant amount of money on self-care. They fight, and Byrd finds himself alone and confused. 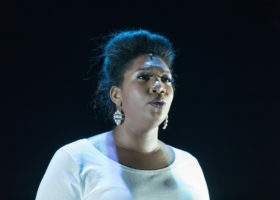 In “Kalopsia,” a solo number that closes out the first act, Byrd grapples with his diagnosis and chooses to face reality. Aunt Goodie and Thomas poke fun at each other. 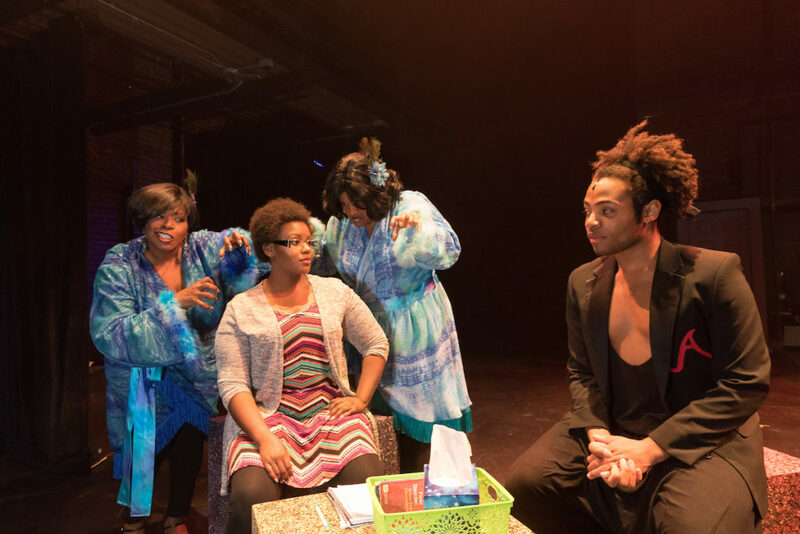 It’s the second half of Kalopsia that truly shines, and we’re introduced to a robust cast of characters when Byrd heads home to Baltimore to see his family. Whether born of denial or ignorance, his family—his mother, aunt, and grandfather—are unable to accept Byrd’s admission of mental illness, though his close friend Shantel remains by his side. 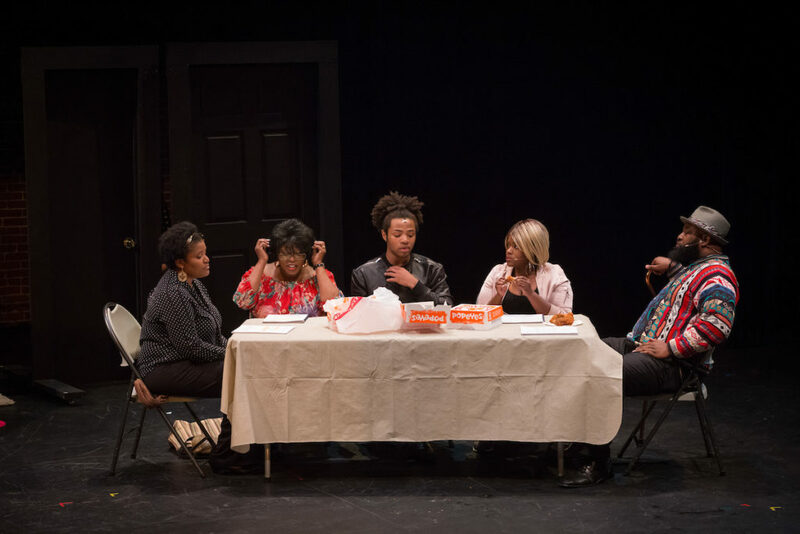 Throughout the remainder of the play, Byrd and his family push through a number of roadblocks, from the idea that mental illness is an affectation, to the desire to “keep home at home” and not publicize uncomfortable truths, to the value of religiosity and a community found through church (and a hilarious attempted exorcism scene), to a family secret finally aired–and then a confessional twist, which in the end brings Byrd and his family together in a loving compromise. Kalopsia has a few faults, from some microphone technical difficulties and an uneven balance between the otherwise excellent backing band and the actors’ vocals. 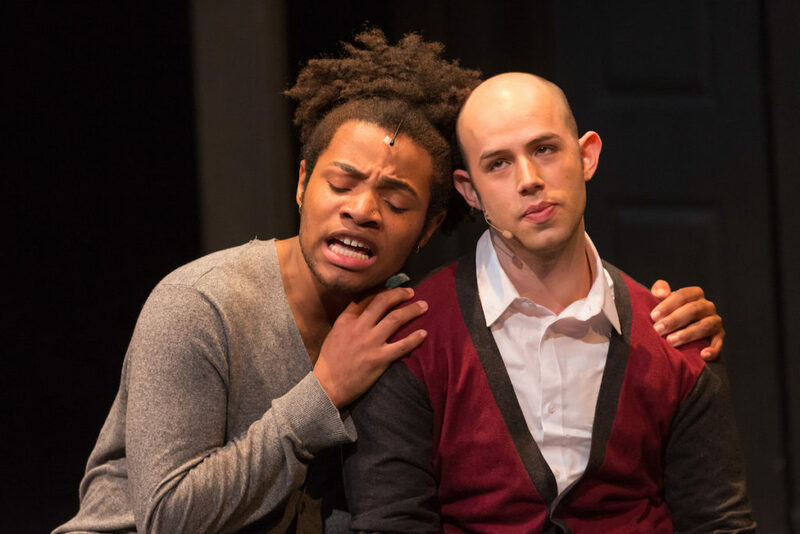 But the story is expertly crafted; the songcraft is textured and strong; the staging and set are impactful; each character’s personality and humor are rich and distinctive; and, as a play about mental illness packaged in a comedic musical form, it packs a sophisticated punch. When taking in an artistic piece about mental illness, there’s an expectation of a kind of heaviness. But it’s not the only way to express this, and Kalopsia’s flash and sprightly demeanor are strong evidence for that. Still, there’s an undercurrent of real pain and trauma underneath–but it’s just enough, and it’s woven through in expert fashion, punctuating specific moments that hint at its own depth. 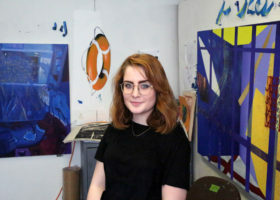 After a full season of the New Hazlett’s 2016-17 CSA program, Kalopsia is a sort of summation of its predecessors’ themes: overcoming prejudices, fighting against societal pressures, maneuvering through complex relationships, and personal growth. 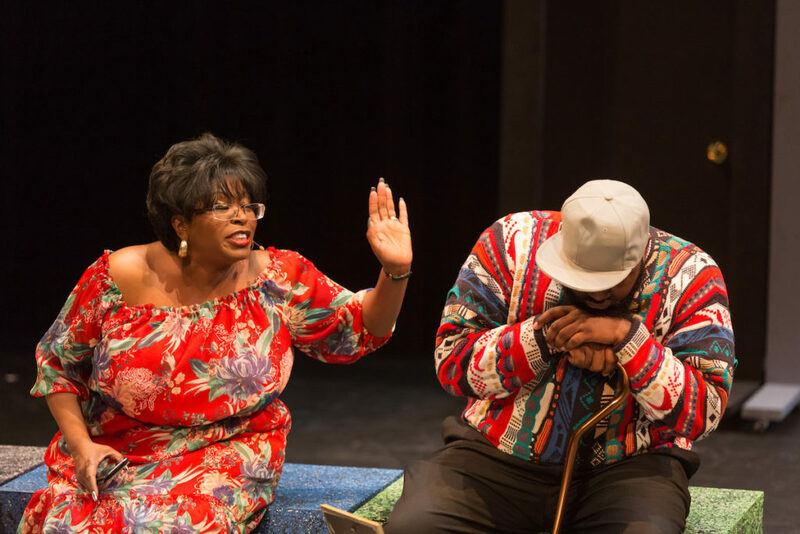 But despite these themes’ heaviness, it’s the incisive, witty, laugh-out-loud humor that allows the audience to digest harsh realities with a relative ease. Kalopsia wrapped up the New Hazlett Theater’s 2016-17 CSA Series and our editorial partnership. Learn more about the next CSA program and the New Hazlett Theater here.